A pleasant if somewhat muddy ramble around Flasby Fell, the modest little fell in Airedale, just a few miles north of Skipton. Although this walk can be started in Skipton there is little to be gained except a couple of extra miles on to the route. Instead we started at a sharp bend on Bog Lane, where there is enough space to park about five cars on an otherwise narrow country road. From Bog Lane we passed through a gate and set off on an initially sturdy track. We were soon deviated from this by a path that climbs the gentle moorland slopes of Skyrakes. Ahead of us were three of Flasby Fell’s five tops including the highest, Sharp Haw. It is not until almost at the last moment that the path steepens for a short pull up on to Sharp Haw, surely one of the smallest summit areas in the Yorkshire Dales. To the north the skies over the Yorkshire Dales were fairly murky, however to the south and south-west the views did include the silhouettes of Skipton Moor, Weets Hill, Pendle Hill, Easington Fell and even a distant Longridge Fell. From Sharp Haw we took a slanting path to briefly join the bridleway before another short steep climb up on to Rough Haw, the second highest of Flasby Fell’s tops. The summit of Rough Haw is much broader than Sharp Haw, the most interesting feature of Rough Haw is the rim of gritstone which includes some fairly large boulders. After having an early lunch in a little shelter just below the summit cairn on Rough Haw we descended NNW to pick up the bridleway again. Around the head of Septeria Gill the path became quite indistinct and muddy in places. Eventually, having crossed a particularly muddy field we gained a firmer track that led us down into the small village of Flasby. The most interesting thing about this track was the amount of moss and lichen growing on everything alonside it. There was a superbly mossy wall but in addition the lower sections of tree trunks and even some plants was covered in bright green moss. After making a brief detour to view Flasby Beck we took the access road to the farm at New Laithe. Passing alongside the large buildings we passed an old boarded up cottage to climb up through some nice parkland before entering High Wood. In the wood the path got quite muddy, though with the amount of rhododendrons about I imagine this section would be quite colorful in the late spring. After a short while we came to a steel bench dedicated to the memory of Helen Handley (1940-2007) and which features the following inscription – “Artist, lover of Gargrave, this hill and so much more!” At the bench we turned off the actual right of way to take a zigzag path up through the trees and a tunnel of rhododendrons to pass through a gate and back on to open access land. Following a wall and then a fence we came to the tiny little tarn that sits below a tall gritstone crag which even has its own cave. Continuing on from the tarn we had to cross over a wall to reach the Crag Haw ridge. Walking south-west along this we visited the sprawling cairn marking the 326m spot height as well as some fairly impressive gritstone outcrops above the largely deforested Crag Wood. Continuing on towards the end of this rocky little ridge we dropped down to our left on a dark streak of a path through some light moorland grass to a gate. The path on the other side of the gate was very muddy and was, quite frankly a bit of a mess. Thankfully it didn’t last long and we were finally able to gain a much firmer track which led us all the way back to Bog Lane. 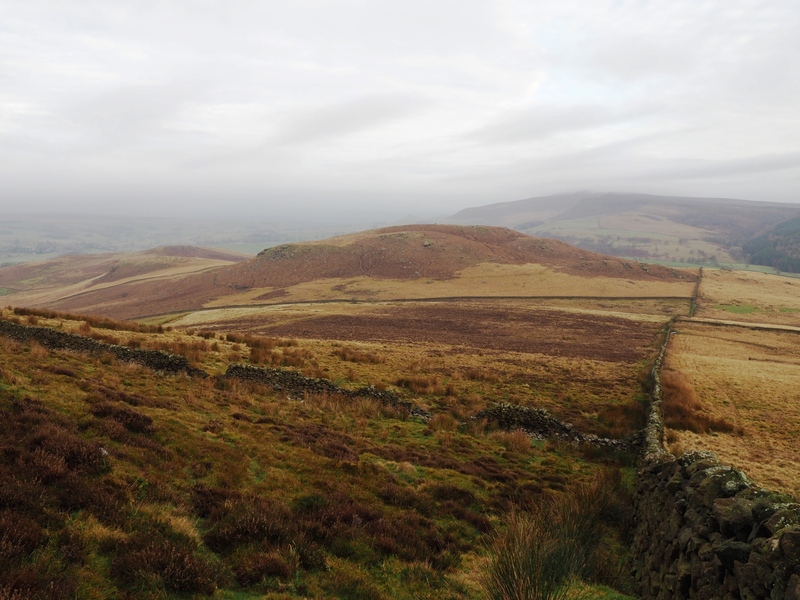 This was a very pleasant little ramble on an interesting little fell. It was a bit of a shame that the sunshine that was forecast only made a distant appearance. On the other hand this was mid-December so conditions could certainly have been a lot worse!